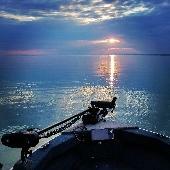 Looking for info on bait presence in the upper Niagara. Anyone seeing any in the usual spring haunts (GI, Sheridan, Ontario St., Ferry) yet? Any info is much appreciated. Thanks. Is Big Catch going out of business? I have heard that second hand. I cannot confirm it to be 100% true though. There is some bait showing up in the ditch at Ontario st by the pipes. It took a good 20-25 min but had a 100 mostly race horse sized minnows. Still none on the east river side of G.I. I’m thinking we’re about a week away. I was there yesterday. Not one minnow to be seen. Thanks Mikey. Very much appreciate the update. Is there a new hole/opening in the fence ? It was all repaired last fall & we couldn't get in. They're certainly not in there big time. You might have been there at the right time. I went there at 2 pm and there were a few. Caught a dozen in a half hour. Lots of ice and garbage floating that you have to work around. Anyone have any updates as to whether baits showing in the Upper Niagara? Thanks in advance.